UPDATE: It appears that AT&T is using AWS for LTE, which is Band 4. Docomo Xi is using Band 1. If Apple is referring to Band 4 when it says "2100", then this likely won't work. If it is referring to Band 1 and Band 4, then it should. As far as I know, NTT Docomo operates the only LTE network in the world at 2100 MHz. However, this doesn't mean that a Docomo iPad is coming. Docomo's and Apple's ideas for branding and marketing appear mutually exclusive. There's no way that Apple is going to allow Docomo defile their product with labeling and preinstalled junk, just like Docomo isn't going to agree to the terms regarding retail display, licensing, etc. that would be likely forced on them by Apple. However, an unlocked version of this next iPad would likely be compatible with an Xi microSIM, but don't run out with that in mind and buy one just yet. Let's see how this shakes out. The SBM version will likely be SIM-locked in Japan. If Softbank Mobile didn't win the 900 MHz allocation, it would have greatly hindered their plans for roll out of an FDD-LTE network, presumably at 2100 MHz. At some point this next iPad will probably be compatible with Softbank LTE, but by the time that happens, we'll be looking back at the release of the next iPad after next, or whatever they call it. Regarding AU, their plans also include 2100 MHz, but like US Verizon, they are a CDMA-2000 carrier. Note that the "Verizon Model" has no indication of 2100 MHz. This is actually wrong - AT&T also runs on the 2100 MHz network. Just posted this on the other post about the Japanese iPad not having 4G but it also gives the 2 bands that are used by ATT in the US - 800mhz and 2100mhz. I there anywhere, other than the linked article (and links therein) when AT&T's LTE frequency bands are spelled out? I went looking for that and couldn't find it. This is why I ask. Everything I see says different, though it ranges from 700 and AWS to 700 and 1700. The only stuff I see saying 2100 is in reference to iPad. http://en.wikipedia.org/wiki/3GPP_Long_Term_Evolution#Frequency_bands (this is wikipedia, so it's probably wrong). 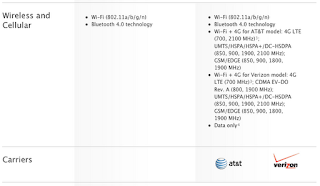 I was looking at this as well, and I'm assuming the 2100 that shows up for the AT&T version of the iPad is AWS-1, a.k.a. LTE band 4, while Docomo runs on LTE band 1, which is 2100. Basically downlink ranges overlap slightly, but uplink is different. That means it won't work, right? 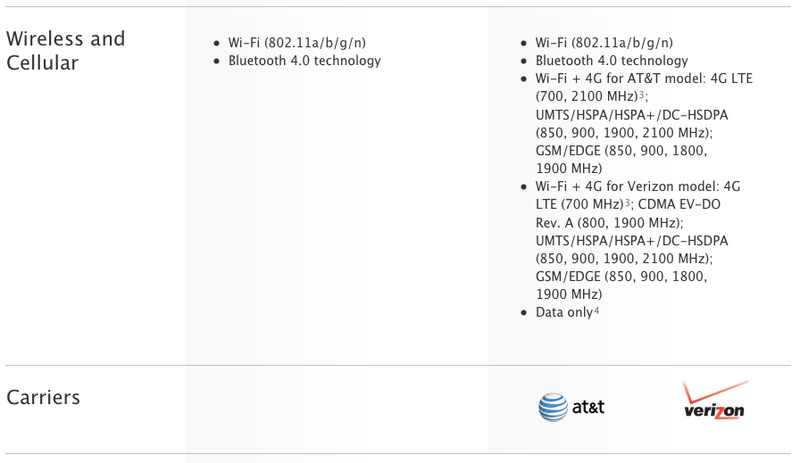 I'm now pretty sure it is in fact AWS that AT&T is using, so Apple saying "2100" is a bit misleading. The conventional name of band I is "2100". That of band 4 is "aws". If the iPad is band 4, it will be interesting to see if it works with band 1. T-Mobile AWS radios work fully with Docomo. I am using an AWS Nexus One in Japan. Thanks for the update - I was also wondering if it was for AWS. I was also wondering if this was put in for the Canadian cell providers where the 700mhz spectrum is still not available for LTE. The Canadian Apple site is advertising the ability to use the iPad on LTE in both Canada and the US and, from what I can tell, most Canadian carriers run on the 1700 / 2100 AWS version of LTE. The Verizon one, however, doesn't work even on 3G with b-mobile's SIM cards. I haven't tried anyone else since I'm only here for 2 weeks and don't want to pay monthly fees for the rest of my life. I assume it is like the iPhones provided by CDMA carriers, where if they are first activated for CDMA use, they are forever stuck that way (sans jailbreaking). if I buy the new iPad from Softbank will i be able to use it on ATT's LTE network when i go there this April?